Blockchain : Insanity or Genius? Vincent Willem van Gogh is remembered as the quintessential tragic artist, having been relatively unsuccessful during his life and plagued by mental illness. While staring at the gardens out the window of the Saint-Paul asylum, could van Gogh even begin to comprehend the idea that some of his final works would be among his most famous and fetch prices upwards of $80M at auction? Could he even understand that his life, his techniques and body of work would be studied and treasured? Could he envision an entire museum dedicated to his namesake receiving millions of visitors each year from across the globe? Did he see the value in what he was creating? Often the ability to perceive value is concealed by misunderstanding, bias or even emotion. On the other hand, demonstrated value would have been in the hands of Vincent himself which, clearly, he was unfit mentally to accomplish. He saw romantic value in giving a piece of his ear to a woman as a token of affection, obviously she may not have shared that view. Now while this example is extreme, it shows the importance of keeping an unbiased, clear-headed view of the opportunities around you. Having been part of a services delivery organization for a significant portion of my career, the day-to-day many times obscured the bigger picture. The mantra "I'm going to struggle to deliver what we have now, let alone something new" is common and completely understandable. Now sitting in a product-focused seat, the landscape expands to the art of the possible and how to find the value in the "what ifs?". What if a new technology could deliver the value it promises, what if it can cut costs and what if it can provide transparency and security? That is one aspect of my role to do the research, the POCs, the assessments. I must remove any veil of predetermined opinion and look upon the works, with clarity. And often this exercise is not simple, the material is difficult to comprehend and application to real-world use cases is fuzzy at best. But that is all part of the process, everything is not black and white, nor does value serve itself up on a silver platter. I have personally had this challenge in my current undertaking evaluating blockchain technologies when looking at the pharma supply chain. There is undeniable wave of momentum behind the tech, and there are start-ups salivating to find that magic solution to ease the woes of pharma executives. One thing that is irrefutable is that the potential of blockchain technology is being tapped in ways which is creating massive hype with business opportunities across many verticals. Consumers goods companies are experimenting with blockchain technologies to provide truth in ingredients and proof of ethical sourcing. Internet companies are testing blockchain technologies to enable micro-payments to be made to websites right through your browser. Healthcare is using the technology to create a publicly available pool of data for clinical trials. Voting systems are being evaluated to use blockchain to authenticate individual voter’s identities, instead of you know… signing that decades old paper ledger like so many of us do today. The music industry is testing using blockchain smart contracts for prearranged license agreements for content sharing. When you look at the wide array of use cases where the tech provides strong value, it is hard to downplay the "what if?". Maybe that value is not clear to you today, maybe you have deadlines and customers and bosses breathing down your neck, maybe you can't get your son to sleep past 5AM… did I just write that or think it?... but hey, these are good problems to have: deadlines mean employment, a 14-month-old babbling to himself and excited to get out of his crib to play at the crack of dawn could literally be the best thing ever. I would urge each and every one of you reading this to keep an open mind. Don't jump to a conclusion. Let this all play out, and I apologize for the lack of metaphorical creativity, but we are only at the tip of the iceberg. 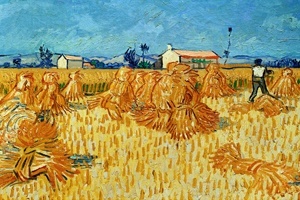 Van Gogh poured his life into his craft, he at times would choose supplies over food and lived in poverty. Not saying these tech companies should in any way have to make that level of sacrifice, but the struggle is real to overcome the stigma that comes with the hype. Step one is clearing your head of any preconceived notions, and step two is to hang on for the ride.